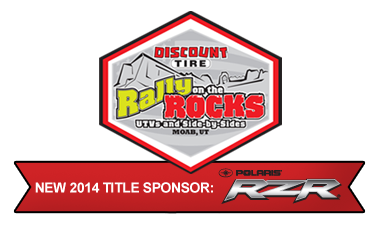 The Title Sponsor for the 2014 is Polaris RZR. Polaris is showing up in full force doing demo rides with theRZR XP 1000 and the all newSportsman ACE. 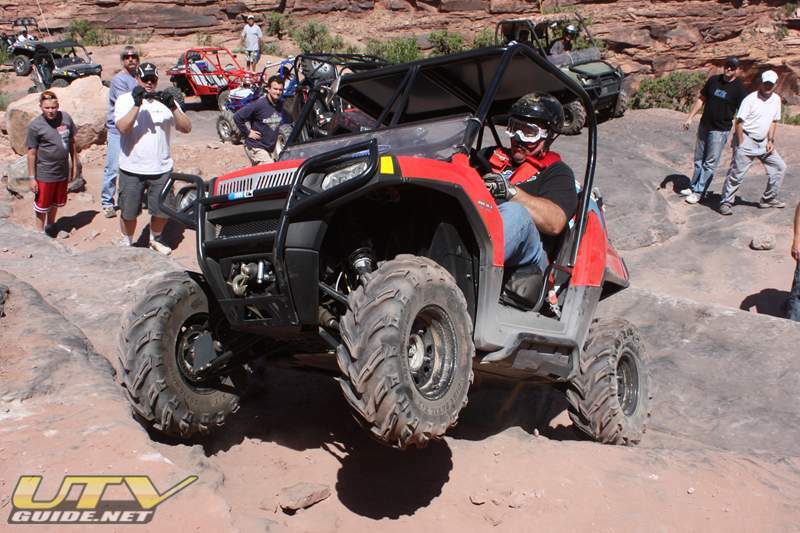 Discount Tire Rally on the Rocks is held in Moab, Utah on the weekend following Mothers Day. The event is headquartered at the Old Spanish Trail Arena on HWY 191. (3641 S Hwy 191, Moab, UT 84532). Discount Tire Rally on the Rocks (ROTR) is a guided trail ride event. Our trails cover everything from the extreme rated 10+ to a scenic dirt road 1 rating with everything in between. Rally on the Rocks has over 20 distinct trails to choose from! There are no bad trails in Moab as it is arguably the most scenic, unique place on the planet and is perfectly suited to UTVs. Cliff Hanger – The 8 rated Cliff Hanger trail lives up to its name. You will be hanging on a cliff, negotiating some formidable ledges with Jackson Hole several hundred feet below getting your attention. Right from the beginning you will be gripping your steering wheel tight as you drop in from the trail head. Prepare yourself for a fun filled day. Hell’s Revenge – The 5+ rated Hells Revenge trail exposes great expanses of Slick Rock (sandstone) with slopes so steep you will wonder if your tires can maintain traction. The very steep climbs and descents on the slick rock are not for the faint of heart and cannot be bypassed. Behind the Rocks – The 8+ rated Behind the Rocks trail offers extremes in 4-Wheeling from two track level road to obstacles that most drivers with good sense would avoid. Views of the very rugged Behind the Rocks weather sculpted sandstone are impressive along the way. Running it backwards compounds the difficulty of the key obstacles. Breakdowns are to be expected and roll-overs are not uncommon. Steel Bender – The 6 rated Steel Bender trail follows a historic wagon road that works its way up from a beautiful canyon to elevations above 6,000 feet. It features 2 creek crossings, numerous steep ledges, and two challenging rocky climbs that have bypasses. Steel Bender starts on private land immediately northeast of the Moab Golf Course and ends at Kens Lake. This is a trail that can be run in reverse and is becoming increasingly popular to do so. Moab Rim – The 7+ rated Moab Rim trail ascends steeply tilted rock strata to climb to the top corner (and beyond) of the Moab Rim at the Colorado River just east of Moab. Dangerous obstacles, spectacular views in all directions and ancient Indian ruins add excitement to the trip. Tech Trails are for those of you that want to push the limits of your rig and your mind. These trails are among the most difficult Discount Tire ROTR has to offer. In order to participate in a tech trail your rig must have the following REQUIRED items and MUST pass a free tech inspection onsite. You must have a long travel SXS, (factory long travel is ok. Polaris RZR S, RZR 4, XP, XP 4, Wildcat) winch, full under body skids, fix-it kit; air pump, plugs & straps, 4 point harnesses, 6 point cage. Driver and all passengers MUST wear a D.O.T. approved helmet.